Fluorine has played an important role in the pharmaceutical and also the agrochemical industries already for several decades. It is well known that the effectiveness of many complex molecules is significantly enhanced by the presence of even a single fluorine atom. In the early days, hydrofluoric acid was extensively used to provide the required fluorine addition. Subsequently potassium fluoride was used, particularly in halogen exchange reactions where it is necessary to remove a chlorine atom and replace it with a fluorine atom. Potassium fluoride is much easier for the user to handle and has a much greater degree of selectivity than hydrofluoric acid. It is still popular nowadays and is used as the preferred fluorine source in a number of insecticides and herbicides, as well as in some proprietary analgesic preparations, anti-biotics and anti-depressives. Even more recently, significant progress has been achieved in the development of a range of organic fluorine compounds based on CF2 and CF3 groups. These included an anaesthetic preparation and a well-known anti-malaria drug. In the last years, giant steps in this area of research have led to the development of a range of increasingly complex organic intermediates. They are still based on the old building blocks, but manufactured now in modern industrial processes. This development has opened up a wide range of opportunities for manufacturers of both pharmaceutical and agrochemical products. Most of the leading agrochemical companies are currently carrying out research into the use of these chemicals for both insecticides and herbicides. Modern medicines which now benefit from these developments include a leading anti-arthritis drug as well as a very promising treatment for HIV. There is another extremely important area of medicine where fluorine chemistry plays a vital part. For many years, chlorofluorocarbons were used as the propellant in metered dose inhalers. Since the Montreal protocol and the subsequent agreement to ban CFCs, a new generation of propellants has been developed. These gases, whose effect on the ozone layer is zero, are known as hydrofluorocarbons, usually abbreviated to HFCs. 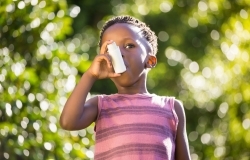 Asthma patients around the world who rely on inhalers for their treatment now benefit from this development. Work continues also to use these gases to deliver other medicines to the lungs to treat a broad range of medical conditions.